We baited the Target 5/0 snapper hooks on our Paul's Fishing Kites Dropper Rig with salted mullet and ran two 10 hook sets. Conditions were perfect and the gear set straight out both times. In total we caught three snapper, two gurnard, a couple of kahawai and a kingfish. 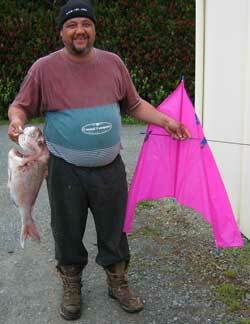 It was the first time we used the kite and we fished 5.2 kilometers up from Rimmer Road. As first timers we would have been pleased to catch anything at all, so we were over the moon when this 18.8 pound snapper come in through the surf. 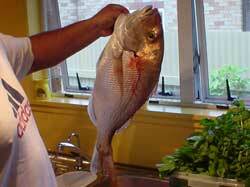 This 7 pound snapper was caught at labour weekend at Whangarei Heads. I'm really happy with the decision I made to put double floating beads on all my Paul's fishing kites boat longline traces, they work great. 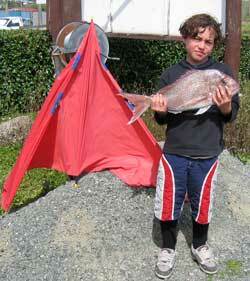 Paul's Fishing Kites Kaitaia agent Tenga Reese sent in this pic of nine year old Brandon Wilson who helped catch this 2.36 kg snapper on a kite rig. 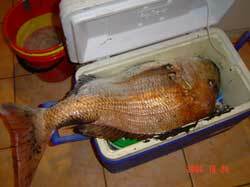 And the picture below of the Mole with one of 16 snapper he caught recently night fishing off Tokerau beach on a Monday night. If you are up Kaitaia way drop in and visit Tenga at Kaitaia Air and Tackle, you will find his store on North Road just north of the main shopping centre. He has attended two of our demos and is very knowledgeable on using kite up-riggers on dropper rigs. He is a great guy and is always willing to chat about the local fishing spots, take your catch photo or help you with all your kitefishing needs. 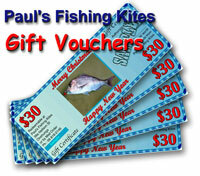 The following 12 entries have won a $30 Retail Value gift voucher for Paul's Fishing Kites products. If your pic is here please contact us for your voucher. Thanks to all those who submitted photos and catch reports, it really helps with the newsletter production. Click the link or fish photo to view full size. ED : The following three reports had been "lost" by the editor, apologies to the writers for not putting them in earlier. Sunday, August 22nd, the winds were very light from Orewa. We initially tried to set 10 hooks from our flexiwing rig but with the fickle winds the gear took a long time to set out. We decided to reduce the number of hooks to six and this worked really well. The gear went out without any problems and we wound up with nine good sized snapper from two sets. Geoff Litton, who had been kitefishing just down the beach from me on my last trip out caught his first really big snapper. Mr Litton has just recently become interested in kitefishing after observing myself and others on the beach catching big fish with our rigs. He's been a keen boat fisherman most of his life, but after recently purchasing a kite longline rig and catching some great fish on his first set, he's amazed at how easy and enjoyable kitefishing is. During the recent spate of North Easterlies I took a trip out to the west coast. The winds were a bit fickle on the beach despite the stronger winds inland so I had a bit of trouble setting the gear through the strong rip. Finally got the gear out 1000 metres at low tide baited up with salted mullet. This set returned five superb fat gurnard. 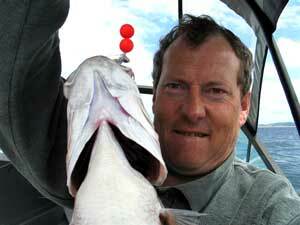 No other species were caught. Another kite fisher further down the beach did a longline set and only got two gurnard. My second set came in empty. A lady and her retired partner stopped and had a chat with me and told me they got busted off by something just the day before, thus exporting their kite and most of their backbone to Australia. They told me where they were fishing and I suspect they may have been snagged. Maybe the remains of the boat that got swamped here last summer in the breakers. I believe kite fisher Gary Soschich got a few snapper, gurnard and kahawai two days after I was fishing but I hear he spent pretty much all day on the beach to accomplish this. Robbie reports that recently the red weed is bad at Ruakaka between the rivermouth and DOC camping grounds.